Super Easy and so Tasty Snack Mix Peanut Butter Bars Recipe. These no bake bars are loaded with Chex, Pretzels and Peanut Butter M&M’S! Your Favorite Snack Mix Recipe in Bar Form! 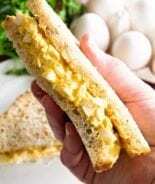 They are great for kids treats when they are busy with after schools activities, perfect for a snack after school or bringing to a party. Everyone always loves them. Let’s be honest here. I’m going to admit something. All those recipes you see on my blog. I rarely make them repeatedly. Sure I have my go to recipes that never fail me like when I need a sweet treat for someplace I usually go to these super easy Monster Cookie Bars. Or when I’m going to a summer time get together I’ll bring my Bacon Ranch Pasta Salad. Of course I have a few “go-to” family, friendly meals for company or to bring to families with newborns like this Spasagna or Mac & Cheese Lasagna! Then every once in a while I fall in love with a recipe and I make it multiple times. Sometimes my family get scared because this is not typical behavior for a woman like me! That’s what happened with this yummy peanut butter bars recipe. I tried them at the beginning of the summer because I needed sometimes to bring to a friends house that had just had a baby. I was kind of sick of all my old recipes and they aren’t strangers at our house so I felt the need to try something new. You know, mix it up so they didn’t get a “Julie Stand By Recipe”. They were a hit, so when my cousin had a baby I knew I had to bring these bars over there. Then I just wanted some so I obviously had to make some to satisfy that craving. 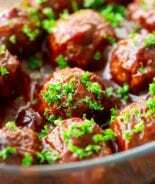 So in a couple short months I had made this recipe three times and I still hadn’t taken a picture of it! Obviously the only way to remedy that was to make them again. Trust me no one was complaining when I made these bars over, and over, and over again! Plus they are so easy I sure wasn’t complaining either. It quickly became a go-to recipe in my book of tricks and I know of all the snack mix recipes out there… you’re going to love it too! In a medium sized saucepan melt butter and peanut butter over low heat. Add marshmallows; cook and stir until melted and mixture is smooth. Pour over pretzel mixture; stir to coat. Add in M&M’s and gently stir until combined. 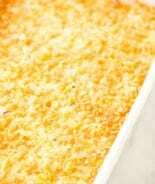 Gently press mixture into a greased 9×13 in pan. Cool. Cut into squares. More Peanut Butter Bars Recipe and Snack Mix Recipes! Snack Mix – Slap a big bowl of this on the table and trust me, this is the first thing that will disappear! Cheerios Snack Mix – Easy to make, sweet and delicious! 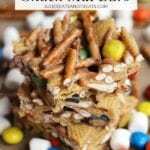 Samoa Chex Mix – loaded with chocolate, toasted coconut and smothered in caramel! No Bake Cheerio Peanut Butter Bars – Ooey, Gooey, Peanut Buttery Bars stuffed with Peanut Butter Cheerios! 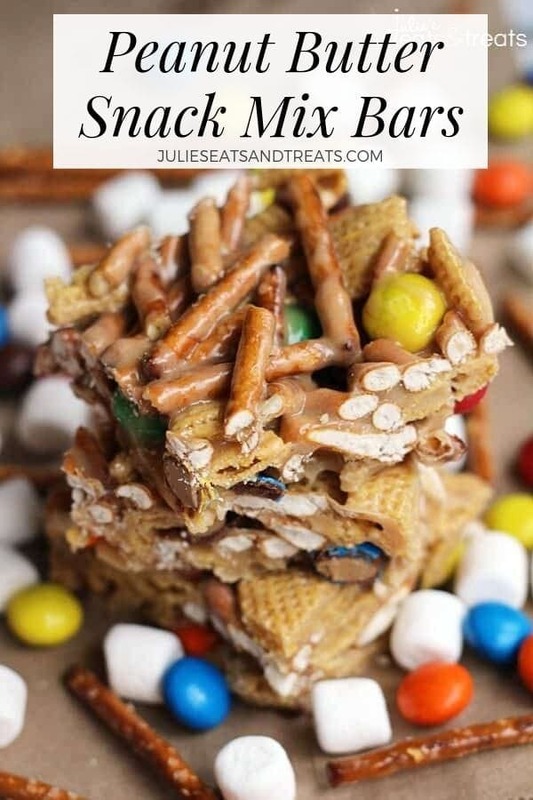 If you are looking for a quick, no-bake treats for the summer these are the perfect sweet and salty snack mix recipes! Plus, if the kids are headed back to school soon these make a great sweet treat for their lunch boxes or after school snack! They are chewy and loaded with Chex, Marshmallows, M&M’s and pretzels! 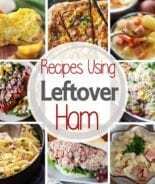 Add it to your arsenal of must make recipes and enjoy! When you try it, please leave a rating below! And if you have an extra moment please tag me on Instagram! I’d love to see pictures of these No Bake Peanut Butter Bars! 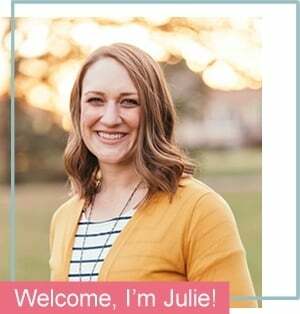 You can find me on Instagram @julieseatsandtreats or just tag me at #julieseatsandtreats! 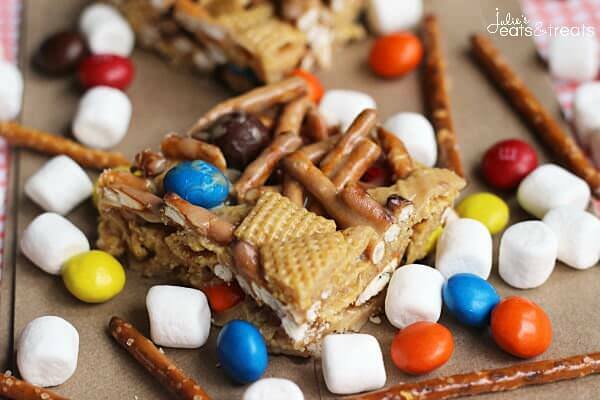 Snack Mix Peanut Butter Bars Recipe - Loaded with Chex, Pretzels and Peanut Butter M&M'S! 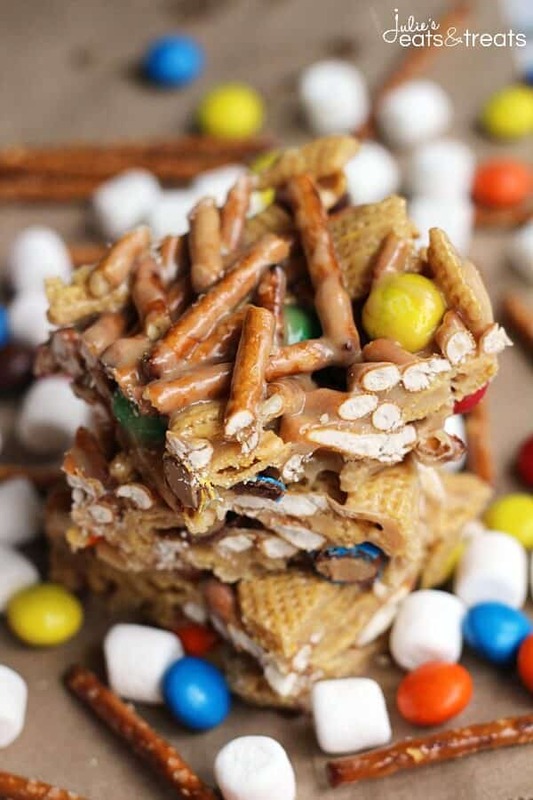 Your Favorite Snack Mix Recipe in Bar Form! In a large bowl, combine the pretzels and cereal. In a medium sized saucepan melt butter and peanut butter over low heat. Add marshmallows; cook and stir until melted and mixture is smooth. Pour over pretzel mixture; stir to coat. Add in M&M's and gently stir until combined. Gently press mixture into a greased 9x13 in pan. Cool. Cut into squares. Thanks a lot Julie, now I am sitting here on a Sunday morning craving these bars! They look pretty amazing and it’s no wonder they were a hit with everyone! I’m seconding what Danielle said. These are so many good things in this bar I just can’t handle it! So much yum in one bar! NEED. this is a dream come true for kids and adults. My daughter would love these. And I’d have to fight her for them. ha! These are SO darn easy and absolutely addictive! I’ll be making them again and again! Right! I had to hide the pan! 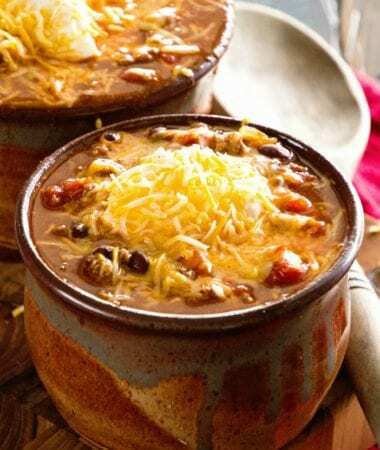 I love that I can just empty out my pantry and make these with what I have on hand! Such a fun snack! Yes! 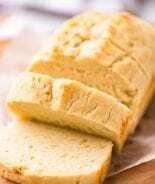 It’s a great recipe to do that with! This is now my new “go to” snack recipe. 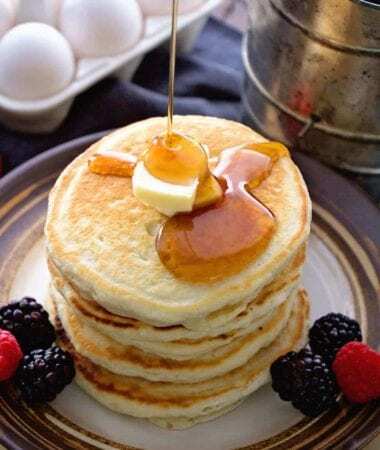 So yummy and so easy to make. My kids loved them as well as the adults. I heard a few comments about them being perfect because they weren’t too sweet. This will be the perfect snack for softball tournaments this summer. Great idea to take it to softball tournaments! So glad you enjoyed it!